Do you ever play roulette with your intolerances/allergies? By that I mean take a gamble on whether you still have that intolerance. At the weekend I sat staring at a bag of Wotsits wondering if they were as good as I remembered. My allergies were diagnosed when I was a child (school age) and it has been 20+ years without Wotsits in my life. I ate the bag, they were cheesy delicious but I paid the consequences for the next three days. As a child you are told that there is a good chance you will grow out of your allergies and eczema. I have had stages in my life where I could tolerate small amounts of cheese, chocolate or cake. I can not explain why this happens but these days everything containing an allergen is off limits. I am even debating whether I can be effected by cross contamination. I have never had problems with this before but recently I have had a few mystery stomach aches and I cannot figure out why. I have spent a large portion of my life wishing I was “normal” when it came to food. I no longer want to be the awkward one when making dinner plans with friends. I hate the fuss and attention that comes from having allergies. The questions people ask and the doubts on people’s faces. You know that look, the one where they judge you as a fussy eater (we have celebrity diets to thank for that). I have even been told I am too fat to have allergies. My mother tells me I vomited continually as a baby but they told her I was a greedy baby because I was eating my foods and gaining weight. In hindsight I was allergic but in the 1970's Mum says allergies were not talked about so it never crossed her mind I could have them. It sounds like the perfect excuse but I came to the conclusion that part of my body's reaction to an allergen is weight gain. It occurred to me that medical advice has been thin on the ground. After the initially childhood diagnosis I never sort medical advice again and just lived my life how my parents taught me. Every now and again it crosses my mind “Could I have grown out of my allergies?” and that leads to a dare devil attempt at eating Wotsits or other foods containing my allergens. I recall a few occasions when I approached GP’s for advice. When concerned about calcium intake I was told “can you not have a bit of cheese every now and again?” Most recently when I spoke of having more frequent reactions I was told if my lips and throat were not swelling up then not to worry about it. The mind boggles but each time I walk away thinking I am probably more knowledgeable than the Doctors. I also realise how incredibly lucky I was that the Doctor I saw as a child was wise enough to figure out why I was covered in eczema, suffering from asthma, glue ear and swollen joints. I guess this blog post is a bit of a personal rant it’s not intended for a sympathy vote. I’ve coped all these years with my allergies and I will keep on managing them. I am only human and I have my grumpy days where my stomach seems against me. There are days when I would do anything to sink my spoon into a tub of Ben & Jerry’s or bite into a Galaxy chocolate bar. Disclaimer - This post was inspired by my own stupidity but I also remember I had read a blog post by Pig In The Kitchen so that was an influence. 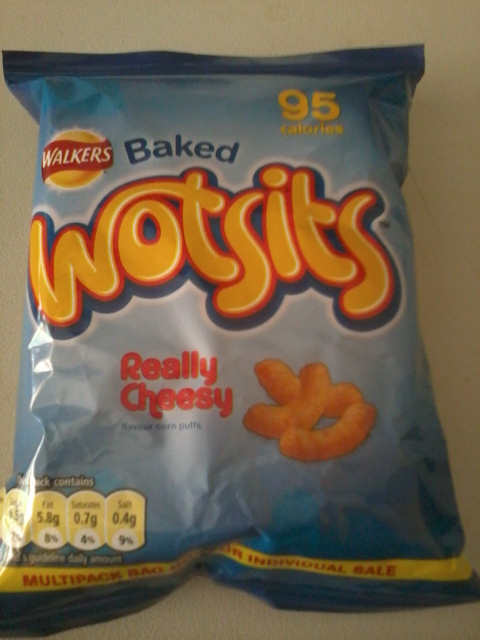 The pack of Wotsits I devoured belonged to my Boyfriend. I do not advocate taking risks with allergies if you have life threatening reactions. Thank you for syaing the things other people can't. Whenever you need a rant you can guarante there are people out there who agree, sympathise and may have done the same! Only the other day, after leaving a crying little one at a childminder and the car breaking down I made the decision to eat........a cadburys twirl! A normal decision for so many others at a time of stress. I too suffered for days afterwards. Sadly it wasnt even as good as I remembered. Are you serious?! Some GPs stupidity & ignorance absolutely baffle me. I know what you mean about awkward situations with friends when it comes to deciding where to go. And my boyfriend doesn't fully understand allergies, and I absolutely hate it when people say in front of him that its possible to grow out of your allergies, because then he starts asking why I'm not trying to get myself better lol. Like its all in my head. So many times I've tried to re-introduce myself to things in the past, and resulted in me being so ill. I'm just not going to bother any more, it's not worth it.